The Centers for Disease Control and Prevention (CDC) said today that based on the number of reported cases of AFM in the United States through November 30, 2018, it appears that the number of persons under investigation (PUIs) for AFM has peaked and will continue to decline for the remainder of 2018. CDC expects states to continue reporting likely AFM cases, and medical experts will continue to review them and determine if they are confirmed. 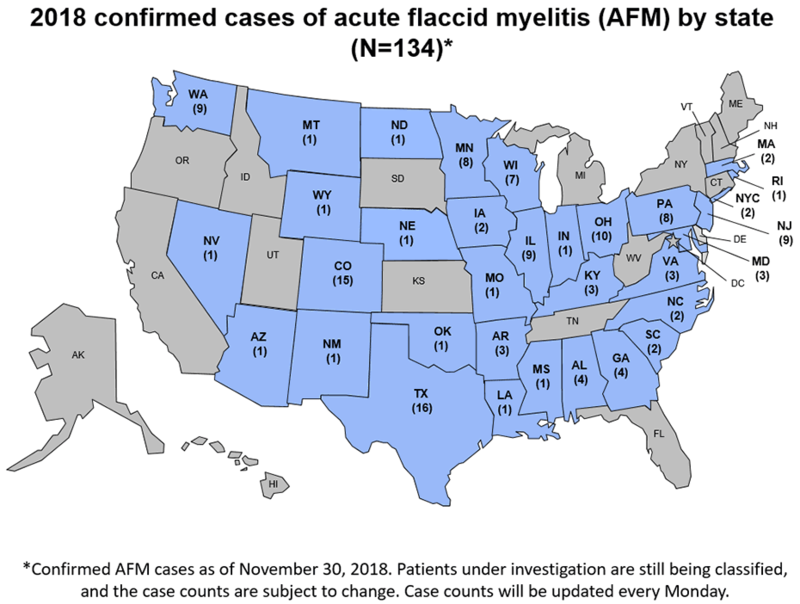 With AFM, CDC has seen a pattern of higher numbers of confirmed cases every 2 years: In 2014, CDC confirmed about 120 cases of AFM; in 2015, 22 cases; in 2016, the number of confirmed cases increased to 149 and in 2017, the number of confirmed cases was 33.